Match.com is one of the most popular online dating sites, and has an extremely wide membership of over 25 million users. With such a high membership, your chances of finding love are definitely at good odds. Whether you’re new to online dating, or you’re an online dating veteran, this is a great site to get involved with. Part of what makes Match.com such a great site, is their confidence that you’ll find love, romance, or even a fun date. Match.com provides its users with all the basic features of online dating sites, but also offers unique features that you may not see on other dating sites. When you first sign-up, you will be asked to fill out a questonaire about your interests and what you’re looking for. This is the first step in helping Match.com narrow down your options. Once you’ve completed this you will be asked to complete a profile, with honest information and a clear, updated picture. This is your chance to really WOW prospective matches. Finally, you’ll figure out which membership you’re interested in. One of the most interesting features of Match.com is their devotion to their members. For example, if you don’t find love within 6 months, Match.com gives its users a free 6 months of online dating. In other words, they are pretty confident you’re going to find what you’re looking for. Tired of using unreliable online dating sites? 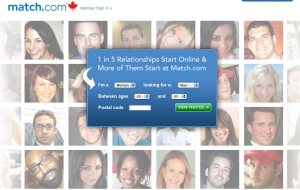 Match.com guarantees its members that their site is legitimate, simply based on some of its outstanding features. For example, Match.com’s MindFindBind 3-step program with Dr. Phil. SO yeah, you’re most definitely dealing with experts here. Match.com has its users best interests at heart, and gives you the option of securing your account if you aren’t ready or interested in being viewed. Now that we’ve learned some of the features of Match.com, the biggest question stands-Why choose them? Well, we found that Match.com is one of the most unique dating sites out there. Aside from the obvious fact that you get audio/visual advice from Dr. Phil himself, Match.com really puts the time and effort into making sure each member is on the right track to finding love and romance. As we mentioned above, Match.com users are asked to fill out detailed information about themselves, and the best part is, you can find out detailed information about other members! Match.com allows for very specific searches, so you can look for specific traits your future man or woman. And of course, you can base this on the good ‘ol zip code, so you don’t waste your precious dating time.